But Japan will get Kirby's Wii U console debut first in January. Kirby and the Rainbow Curse will launch for Wii U in North America and Europe in February 2015, following a Japanese launch on January 22 for 3,700 yen, Nintendo announced. The game sees players journeying through a world made of clay. Players will guide Kirby along a rainbow line drawn on the GamePad’s touch screen. 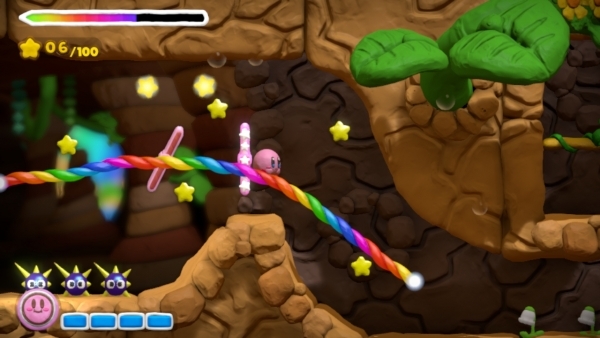 A new four-player multiplayer mode will let one player play as Kirby and focus on drawing rainbow lines, while the others control a trio of Waddle Dee characters that can collect items or carry Kirby around. The Rainbow Curse will also be compatible with Nintendo’s lineup of Amiibo figures, which will unlock bonus content in-game when placed on the GamePad.